Plants or sites where Works Orders are in use will benefit from this optional module to track these alongside efficiency within Modus7. 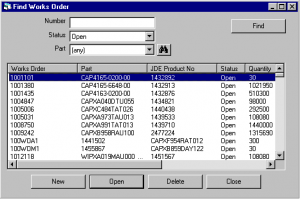 Using Works Order or catalogue numbers from your production systems, the quantity and supporting comments can be entered and monitored. Works Orders that are In-Progress can then be monitored through the additional Works Order reporting feature.